Over a year ago, I made a movie review on Breaking Dawn Part 1. I said it wasn't that good. The story was weak but I enjoyed it anyway. I gave it a rating of 6. It was just a so-so movie. Earlier this month, I watch the second part officially entitled "The Twilight Saga: Breaking Dawn Part 2" at the newly opened Centrio Mall in Cagayan de Oro City. Of course, I came in the theater without expecting that much because of what I got after watching the first part. But, guess what? This movie totally exceeded my expectations. I already said before that I am not a Twilight fan. However, this movie lives up to what it says. It's the epic finale that will live forever. The movie totally took away my negative impressions with the previous one. The story was absolutely good. It was so intense I literally held my breath in some scenes. Plus, the movie had one of the best finales I've ever seen. It was definitely memorable. It concluded the love story of Edward and Bella well. And best of all, the soundtrack captured my emotions as I was immersed in that finale scene. It was perfect! I think the movie deserves a 10. 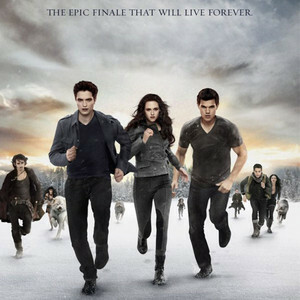 This was the only Twilight movie that left a lasting impression on me.